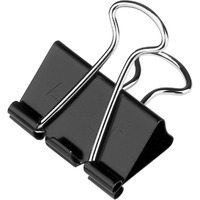 Reusable black binder clip with metal arms securely fastens stacks of paper. Tempered steel provides extra strong hold and clips spring back into shape when removed. Multiple sizes available.12 clips per box.